If you have never Played Lacrosse before, some of the rules may not be clear to you. The Rules have evolved over the years, always pushing to make the Game quicker and keep the Flow going. Box Lacrosse is played in... well, a Box. In truth, most games are played inside Arenas and practices are often held outside in a Lacrosse Box. 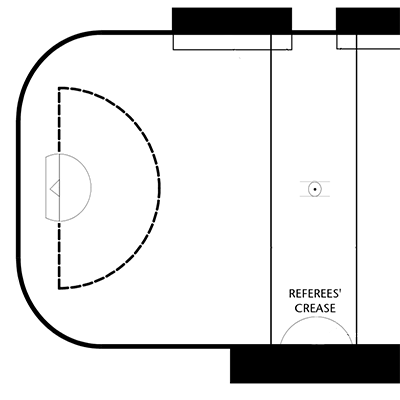 Please refer to the Box Diagram for the dimensions of the playing surface (floor). Eleven feet from the center of the floor, in each direction, are the Restraining Lines. The floor area between these two lines is called the Center Zone, and the two areas outside these lines are called Offensive Zones. Box Lacrosse is played in three 20 minute periods. Play starts with a face off at center floor and, depending on the outcome, each team is either on Offense or Defense. The offensive team has only 30 seconds to take a shot on goal or possession of the ball goes to the Defenders. As in Basketball, a 30 second shot clock is employed, which is reset after each shot or change in possession. The Goal (in Minor) is 4 feet wide and 4 feet tall, and there is a 9 foot Crease area painted on the floor. No offensive player is allowed in this crease, and if he or she does enter (other than being pushed in by a defender) possession will go to the defenders. Interfering with a goaltender inside his crease results in a minor penalty. Defenders who gain possession in their own zone may not carry or pass the ball into their own crease. 24 Feet in front of the goal is another (dotted) Crease called the Defensive Zone. In PeeWee and Novice Divisions, Offensive players who are inside this zone may legally be crosschecked as long as their team has possession of the ball. In all Divisions above PeeWee, the entire area of floor inside the Restraining Lines is used for this purpose. While the offensive team has possession of the ball, the defenders may make contact with & push their 'check'. If a player makes contact with his 'check' while his own team has possession (or the ball is loose) Minor Interference will be called and the opposing team will get possession. Many of the Rules to Lacrosse will be understood using common sense or from a familiarity with other sports, but there are some interesting ones which should be explained. A player may only have control of the ball in his/her own crease for a maximum of five seconds. When playing Short Handed (a player serving a penalty) a team must advance the ball into the opposition's Offensive Zone within 10 seconds of gaining possession. The offensive team has only 30 seconds to take a shot on goal or possession of the ball goes to the Defenders. A 30 second shot clock is employed, which is reset after each shot or change in possession. If a ball goes out of bounds, possession is awarded to an opponent of the team who last touched the ball. This includes the goaltender. An Illegal Cross-check is defined as being applied in a chopping motion, or when an opponent is not on his/her feet, or to a non-ball carrier out side the Defensive Zone. All Face offs are at the center face-off circle. The two players facing off must draw their sticks straight back in a motion that must continue until both sticks clear the face off dot. 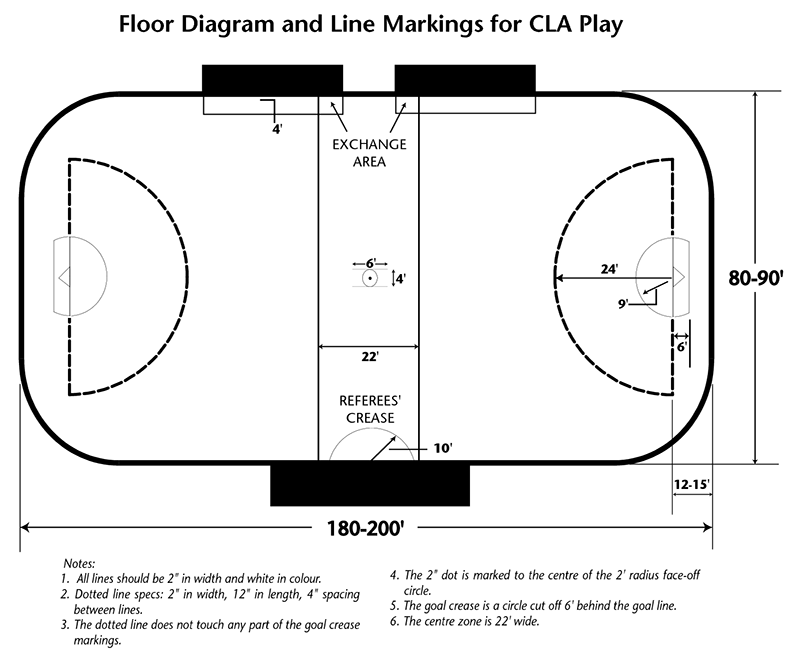 All players who are not taking the face off must position themselves outside of the restraining lines and may not enter the center zone until the ball leaves the 4 foot center circle. If an offensive player pushes off a defender with his/her free hand, possession will go to the defenders. A Defender who uses a free hand to push an opponent (or a stick) will receive a minor penalty. Stick to Stick and Body to Body contact is allowed while two players are actively chasing a loose ball. A Defender may interfere with an Offensive player as long as the Offensive team has possession of the ball. If a player intentionally makes contact with an opponent while his own team has possession, minor interference will be called and the ball goes to the opponents team.